In this lesson, we will learn how to use the distributive property of multiplication to perform mental calculations. 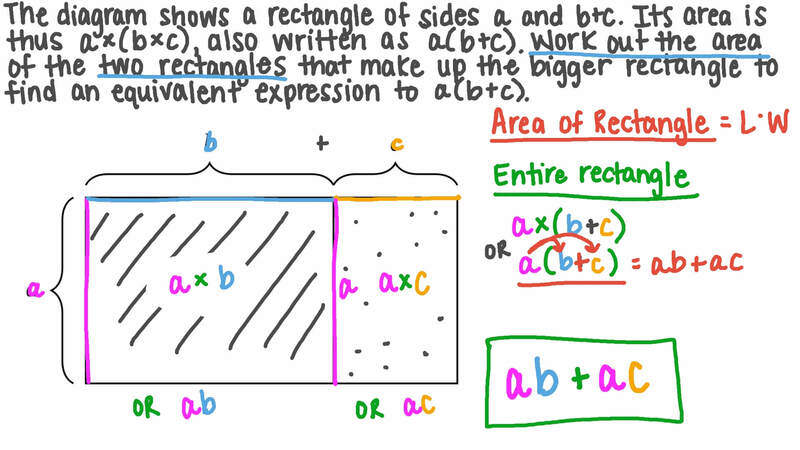 Find the area of the rectangle using the distributive property. The diagram shows a rectangle of sides 𝑎 and 𝑏 + 𝑐 . Its area is thus 𝑎 × ( 𝑏 + 𝑐 ) , also written as 𝑎 ( 𝑏 + 𝑐 ) . Work out the area of the two rectangles that make up the bigger rectangle to find an equivalent expression to 𝑎 ( 𝑏 + 𝑐 ) . Write two equivalent expressions for the area of the following rectangle. Shady used to solve . Use his method to answer these questions. Use Nehal’s multiplication fact to help you. This area model can be used to solve 8 5 × 9 . Find the missing partial product. A teacher has 34 children in her class. They each need 7 pieces of homework a week. By using the diagram, find how many pieces she will have to set altogether. Dina drew this to help her calculate 3 × 1 7 . What is 3 × 1 7 ? Nader is learning to multiply by breaking apart factors and then adding. For 6 × 1 2 , he draws a 6-by-12 rectangle and splits it into two parts. What is 6 × 1 2 ? Shady and Dalia want to use area to find . Dalia splits this rectangle in half, but she can’t finish because she doesn’t know . Shady says it is easier to use the 10 times table. How would he split the rectangle? Pick the next step in Shady’s calculation. Add the areas of the two parts to figure out . Mona used to find . Amir used to find . BOnly Mona’s method is correct. DOnly Amir’s method is correct. Sherif is using this model to find . He split 16 into . What did he split 12 into? Finish his equation by writing the missing addition expression. Evaluate ( 1 0 0 × 8 + 1 0 × 8 0 ) × 3 0 using the distributive property. Ramy split 6 into 3 + 3 to find 6 × 9 . Farida split 6 into 5 + 1 to find 6 × 9 . BOnly Ramy’s method is correct. DOnly Farida’s method is correct. What is 6 × 9 ? The number bond shows that 7 = 1 0 − 3 . Fill in the blank: 7 × 8 = − 2 4 . Hint: Use the number bond and that 3 × 8 = 2 4 . The number bond shows that 1 2 = 8 + 4 . Hint: Use the number bond and the fact that 4 × 5 = 2 0 . Fill in the blank: 4 × 1 0 = 4 × 5 + 4 × . Evaluate 1 , 0 0 0 × ( 5 5 + 9 1 2 − 4 5 ) using the distributive property. Dalia is learning about different strategies to multiply. She drew this to help her calculate . Use this multiplication fact to find the missing numbers.